The Swadisthan Chakra is suspended like a satellite on a chord from the Nabhi Chakra, and moves around the Void area giving sustenance to the ten petals of the Void (which represent Ten Commandments). 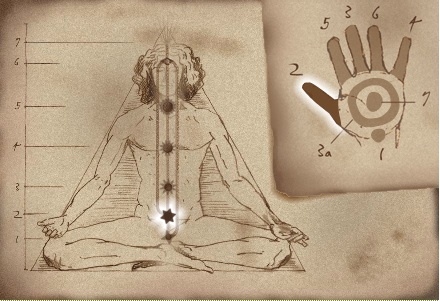 When the Kundalini rises, it passes into the Nabhi Chakra first and then along the chord to enlighten the Swadisthan and then returns to the Nabhi Chakra to continue the journey to the crown of the head. In the course of evolution, man translated his need for shelter into the building of homes. As his sense of aesthetics developed he continued to improve on these forms of shelter (until eventually architecture came about). This creativity evolved into abstract form, where he could imagine, project and create an image, which had no previous material counterpart. From this burgeoning aestheticism came the creative arts. 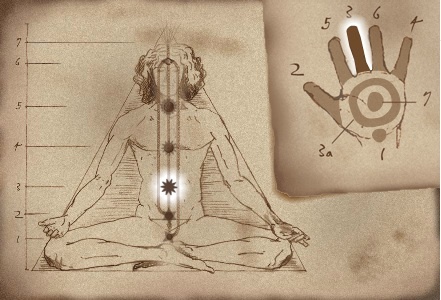 The process of creativity in whatever form draws on the qualities of the Swadisthan Chakra. If this process is accomplished in a balanced state (i.e. using the energies of the central or Sushumna channel in the subtle system) then the result is spiritually enhanced, we can say that it had “heart”. After realization this is emphasized, and the resulting creation can become an inspired work. We can see this by looking at the classic works from artists of the past such as Mozart and Michelangelo who were born as evolved realized souls. Works of this quality are immortal, and provide joy and beauty that define the whole epoch. If artistic endeavor starts out “with heart”, there is a tendency for the artist to produce later works which are flat, lifeless or even exploitative. The primary cause of this tendency is the ego of the artist. As the artist becomes more successful, he or she works harder to maintain or grow this success. This requires more exhaustive use of the right channel (the Pingala Nadhi or Channel of Action). A by-product of this channel becoming exhausted is that the ego of the artist becomes inflated. Note that in subtle terms the ego is actually situated at the end of the action channel (in the balloon-like shape on the left hand side of the head). As the artist starts to believe that he is the creator of all his works (thus eliminating divine inspiration) the process is accelerated and the ego expands to such an extent that the spiritual content of these works is removed completely. The most important physical function of this center is that it breaks down fat particles in the abdomen to replace the grey and white cells in the brain, and so generates the energy which fuels our thinking. Excessive thinking and planning overworks this process and exhausts this center. The Swadisthan also looks after the liver (along with the Nabhi Center). If the Chakra is having to cope with excessive thinking, then the other organs it is supposed to look after are neglected. The liver is particularly susceptible to this neglect. Problems here are indicated by tingling in the thumb and middle finger of the right hand, or by prickling sensations in the hands. The liver has a particular importance in that it is the seat of our Attention. Attention should not be confused with thought, which comes from ego (our I-ness) and superego (our past conditionings and upbringing). Attention is pure concentration minus thought/mental activity. For example when we look at the flower we put our attention on it (i.e. observe it). However we will also think about it (“that’s pretty I wonder what it is called” etc.) Attention has no associated thoughts – it is pure concentration / observation / witnessing. A balanced liver sustains and nourishes our Attention and filters it by scanning out any impurities and external clutter. From this purified Attention comes the peace and stillness that we obtain in our meditation. The liver is susceptible to overheating (via alcohol or other stimulants) which has a detrimental effect on our Attention, which ultimately weakens our meditations. A weakened Swadisthan may show up in a number of ways: diabetes, heart disease and associated problems, difficulty meditating, irritability. Interest in spiritualism and occult practices will also have a detrimental effect on this center. If we delve into these realms we lead the Attention into the collective subconscious areas, and we leave ourselves open to increased lethargy, and maybe even hallucinations and increased overall negativity.